Shacknews got a behind-closed-door demo of the Oculus Rift S at GDC 2019. Please take a look at our hands-on impressions. Shacknews stopped by a closed door demo at GDC 2019 to try out the latest virtual reality headset from Oculus. The Facebook subsidiary unveiled the Oculus Quest VR HMD last year, leaving PC enthusiasts feeling a bit left out. 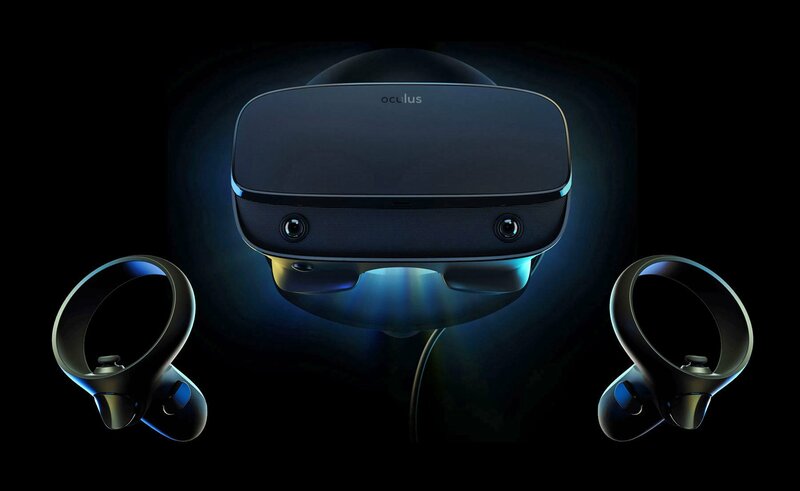 PC VR players now have a new headset to look forward to with the announcement of the Oculus Rift S.
Oculus has stepped up the game with their latest VR HMD. The first noticeable change from the first generation Rift is the improved optics. Oculus claims that their “next-generation optics have a sharper display that deliver bright, vivid colors and reduced ‘screen-door’ effect.” Facebook has also changed the interpupillary distance (IPD) settings to be based on software, which definitely will provide more accuracy than the original HMD’s physical solution. I definitely noticed the improved visual fidelity of the HMD, but it is hard to quantify the improvement from the first model of the Rift. Facebook is not providing many details other than vague statements of Rift S being better, which I can confirm from my time in the headset. The Rift S also features built-in audio that is similar to the technology in Oculus Quest. This is a great improvement from the original flip down solution. The speakers are located perfectly and are hard to even see on the device. The Rift S features five different tracking sensor cameras. This eliminates the need for three USB ports like the original Rift. Oculus Rift S does not require three USB ports like its predecessor. This is accomplished by the addition of five camera sensors placed on the Rift S VR HMD. The tracking experience was great during my demo session, and it definitely felt better than Oculus Quest’s tracking. The additional sensors and being tethered to the PC do still offer a lot of benefits that VR enthusiasts would enjoy. The Dead and Buried 2 demo at GDC 2019 showcased the best PC inside-out tracking that I have ever experienced. The Rift S only takes up one USB port, which really makes it a lot easier to set up and maintain for PC players. One also has to wonder if passthrough capabilities will happen down the line for Rift S and Quest, as both HMDs have added great camera sensing technology to achieve solid inside-out tracking experiences. The Oculus Insight tracking system makes the Rift S a very compelling PC VR HMD in an increasingly competitive landscape, and it would be interesting to see if it has any AR features down the road. Rift S will support the newly redesigned Oculus Touch controllers. The controller experience was solid with the Rift S, and I was able to run around Dead and Buried 2 while dual-wielding weapons. I did not experience any jarring loss of controller tracking that happens sometimes with other Windows MR HMDs that feature less sensors. The Rift S will use the new Oculus Touch controllers with a redesigned menu button that prevents accidental presses that can break immersion. The controllers are another improvement over the original Oculus Rift that really provide an improved overall experience. The fit wheel and new padding are some highlights of the improved ergonomic design of the new VR HMD. The Rift S weighs slightly more than its PC predecessor, but the industrial design team at Oculus makes up for that with a number of very intelligent tweaks to the HMD. The padding in the headset is made from a way more comfortable material, and the counterbalancing of the device is similar to Sony's PSVR HMD. There is also a button to pull the front of the headset away from your face which makes operating the Rift S while wearing glasses a breeze. Oculus has also added a fit wheel on the back of the headstrap that allows easily tightening of the HMD. There are several design cues that Facebook clearly lifted from PSVR, and these additions make the Rift S very comfortable. Is Oculus Rift S worth the upgrade? The HMD is priced at $399, the same price as the Oculus Quest. PC gamers who have not jumped into the wild world of VR head-mounted-displays now have a relatively easy to set up, and less cumbersome device to add to their gaming arsenal. I will likely upgrade to this new device when it launches later this year largely due to the improved ergonomics and new Insight inside-out tracking. The Rift S is still powered by a PC, and that provides the device some great opportunities to push graphic fidelity and frame rates to levels not seen in standalone devices. Oculus has yet to converge mobile and desktop VR into one device, and Rift S is a solid upgrade to existing Rift players and it is certainly a solid value when compared to the PC HMD competitors out there. Head over to the official Oculus website to find out more about the Rift S. The Oculus Rift S PC VR HMD will ship this Spring and costs $399. Thanks for covering it. I'd never thought about moving the Home/Oculus button, but a couple of people I've demoed to on the OG Rift did indeed press it accidentally and were confused about what was happening, so that's probably a good change. I’ll probably get one when they drop a little bit. I’m intrigued by the idea of retiring my dumb desktop cameras, and I never got a third, so my roomscale is wonkier than it could be (though I honestly don’t have enough room to have a huge play area). I wish the resolution was higher, and I’m concerned about the bass on the in line headphones. The low end frequencies of the Rift headphones were pretty good. If these aren’t touching your ears and not somewhat sealing them, I’m worried it will sound tin-ny. People can still use headphones with the device, but that is a good point about low frequencies. The audio thing is what bugs me the most — the LED is certainly a step down, but the screen door reduction might be a welcome trade-off — but the audio... holy mistake, Batman! The beauty of the current rift is that you can just flip those little guys up and down over your ears and you’re good to go. I’m sure you can plug-in some good quality earbuds with a nice seal to your ears that will sound far better than the old headphones, but the simplicity was what made it so awesome in the original. Not having to fiddle with extra wires and such. There's a 3.5mm jack on the headset itself, so if it is a problem it's one you can remedy. Yeah but like atomicgarden said — they worked really well! No doubt. But they're also isolating - both a good and bad thing. I'd want to try the new ones before passing judgement. Haven't had a chance yet, but I'm planning on picking one up as soon as they're available. My main concern for that device is the battery life. There's that, but for me it's how high the experiences scale. Obviously I'm not expecting it to match the full rift, but could it do something like I Expect You to Die at similar fidelity? Also want to see how easy the side loading is; apparently it's pretty open in that respect, which is good. Are the new Touch controllers included in the price? I would guess not. Is a disappointing statement. I imagine this still won't be good enough for flight sims which can be pretty darn hard to read gauges and displays without leaning real close in. I love VR for sims but the resolution really needs a big leap forward. Yeah, it would have been nice if Facebook actually gave us concrete stats. Disappointed resolution + frame rate don’t even match the basic Windows MR headsets’ for that price, also don’t understand why they couldn’t wait until they merged it with the Quest. This is clearly a cost-reduced rift more than anything else. Which, if the experience really is analogous, is fine with me. There is still real benefit to being on their platform - no one else matches their user experience. So this reminds me that I have a rift and the touch add-on (three cameras, two touch controllers) that I haven’t used in like 1.5 years. What would be a fair price to sell it for? Anyone here want it? The bit about glasses is really helpful. That's my biggest gripe about headsets. Extremely disappointing "advancement".. we're still waiting for them to release something with at least 200° FOV and minimum 1440p resolution. Instead they give us this abortive garbage.